With more than 55,000 known compounds serving myriad functions in all forms of life, the terpenoids are the largest as well as the most structurally and stereochemically diverse family of natural products found on earth. Terpenoids are found in marine and terrestrial plants, fungi, bacteria and insects and have many applications in agriculture as antifungals, herbicides or insecticides, as fragrances in cosmetics, or as antibiotics, anti-cancer agents, hormones or contraceptive agents in medicine. Despite their structural diversity, all terpenoids are biosynthesised from two chemically related molecules, namely Δ1- and Δ2-isopentenyldiphosphate, an observation which was first made by the German chemist Otto Wallach more than 100 years ago (Nobel Prize 1910) and put on the correct biochemical foundation by Leopold Ruzicka in Zurich (Nobel Prize 1939). The isopentenyldiphosphates are joined in elongation reactions to form the linear precursors of all terpenoids, which are classified according to the number of isopentenyl-units (C5) they contain as monoterpenes (C10), sesquiterpenes (C15), diterpenes (C20) and higher molecular weight terpenoids. The action of terpene synthases then converts these linear precursors into a large number of cyclic products. It is these cyclisations that are responsible to a large part for the diversity seen in terpenoid natural products. Remarkably all these enzymes share a common three-dimensional fold and hence the complexity and diversity of the final structures is contrasted with the simplicity of the generation of these products. 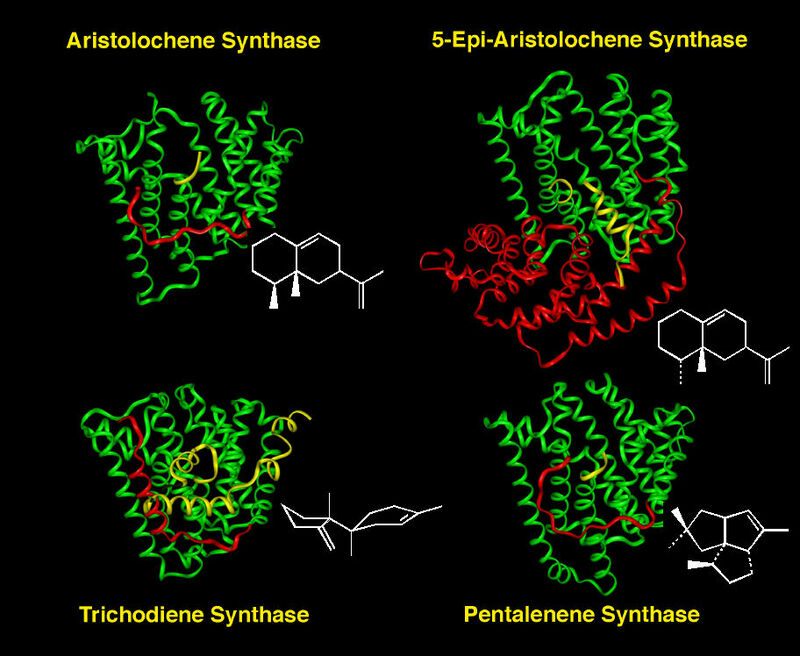 In order to decipher the code that determines the specificity of terpene synthases a much deeper understanding of individual reaction mechanisms is required.We have previously used techniques where the substrates were modified or where individual amino acids within the active site of terpene synthases were replaced with others and the effects on the reaction studied. This latter approach is limited by the fact that only 20 different amino acids are normally observed in naturally occurring proteins.We now wish to use a new technique that allows the incorporation into enzymes of non-natural amino acids that can be chosen in such a way as to obtain answers to specific questions about the reaction mechanisms and hence further our understanding of this fascinating group of enzymes. This work should eventually provide us with the knowledge to generate new terpene-like, but non-natural molecules with many potential applications in basic science and industry. • Xiaoping Tang, Rudolf K. Allemann and Thomas Wirth Eur. J. Org. Chem., 2, 414–418 (2017). DOI:10.1002/ejoc.201601388. • Daniel J. Grundy, Mengbin Chen, Verónica González, Stefano Leoni, David J. Miller, David W. Christianson and Rudolf K. Allemann Biochemistry, 55, 2112–2121 (2016). DOI:10.1021/acs.biochem.6b00115.